Oregon Business held its 22nd annual 100 Best Companies to Work For in Oregon celebration Thursday night in the Oregon Convention Center. Celebrate the 22nd annual 100 Best Companies to Work for in Oregon! 6:30-8:30 p.m.: Dinner and Awards Program with keynote by Ken Madden founder and co-owner of Madden Industrial Craftsmen; video highlights of the 100 Best; Top 10 Company countdown; and unveiling of the full ranking of the 100 Best Companies in the March issue of Oregon Business. Check out interviews with employees from some of the 100 Best Companies to Work For in Oregon winners and find out what makes their company a great place to work. Our 100 Best Companies project turned 21 this year, so pop open the Champagne. Our latest survey gives us plenty to cheer. The following demographic and industry reports are available to all 100 Best survey participants that purchase a Comprehensive report. Each demographic or industry report costs $675. 100 Best survey participants: After all the effort you and your employees put into the 100 Best survey, don't forget to obtain the results and share them with staff. Get detailed feedback and data to help pinpoint areas for improvement and hone your best practices. 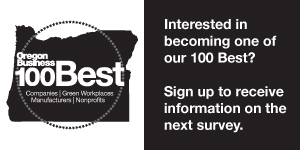 Celebrate the 21st Annual 100 Best Companies to Work For in Oregon! 6:30-8:30 p.m.: Dinner and Awards Program with keynote by Luke Kanies, founder and CEO of Puppet Labs; Hall of Fame awards for companies that made the list 10 or more years; video highlights of the 100 Best; Top 10 Company countdown; and unveiling of the full ranking of the 100 Best Companies in the March issue of Oregon Business.